The Chinese Spring festival kick starts ‘world’s largest human migration’, and America’s premier dog show will see 2 new breeds participate. Venezuela has spiralled into a deeper crisis after national assembly president Juan Guaido took oath as the country’s president Wednesday. Incumbent president Nicolas Maduro had assumed a second term earlier this month, amid an economic crisis that has engulfed the country, sparking widespread civic unrest. Addressing his supporters outside the presidential palace in Caracas Wednesday, Maduro announced that he was giving US diplomats 72 hours to leave Venezuela after US President Donald Trump and his administration formally recognised Guaido as the interim chief of the country. Guaido had called for fresh elections, promising a string of other development and humanitarian steps. 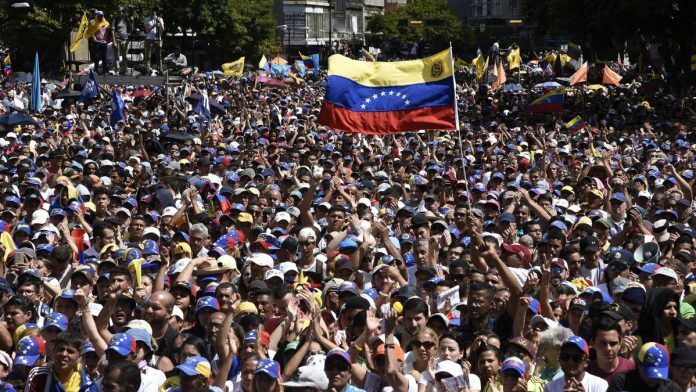 Thousands of anti-government citizens rallied against Maduro’s socialist regime, during which Guaido said: “Today, 23 January 2019, I swear to formally assume the powers of the national executive as president in charge of Venezuela. “Let’s swear as brothers that we won’t rest until we gain freedom,” the 35-year old leader added. Other than the US, Venezuela’s own neighbours including Argentina and Brazil and countries such as Canada have recognised Guaido. Venezuela has the largest crude oil reserves in the world and was once Latin America’s richest country. It is said to have begun its downward spiral drastically under former president and Maduro’s political mentor Hugo Chavez, whose tenure began in 1999. But when Maduro took office in 2013, annual inflation skyrocketed. The country’s economic landscape, now in hyperinflation, recorded an 80,000 per cent inflation rate by the end of 2018. This has also consequently caused worrisome food shortages, along with limited medicine supply for its healthcare industry. Power cuts have also disrupted people’s everyday lives and employers are worried if they will be able to afford a 60-fold rise in minimum wages since last year. More than 3 million Venezuelans have fled their country in search for better prospects. The opposition, by leading agitations against the Maduro establishment Wednesday, was hoping that the pro-government military would break ranks with Maduro, a step that could be significant in toppling the incumbent president. However, the country’s defence minister Vladimir Padrino has reassured support to Maduro’s government, saying “the soldiers of the nation do not accept a president imposed in the shadow of obscure interests or self-proclaimed at the margins of the law”. BBC report: Venezuela crisis: Who is parliament leader Juan Guaidó? According to the Chinese calendar, the Lunar New Year Spring started on 21 January. As families prepare for the Chinese New Year that falls on 5 February this year, Chinese migrant workers are travelling back home to their families. This travel rush of skilled and unskilled workers is called ‘Chunyun’ — termed the ‘biggest human migration’ on the planet, as close to 3 billion trips are expected to be made during the 40-day rush between 21 January and 1 March. This is a 0.6 per cent rise from last year. To keep up with the rush, authorities have increased the availability of the means of transport. The Chinese Railway Authorities have increased services to 4,860 trains (a 5.2 per cent jump from 2018). Similarly the Civil Aviation Administration has scheduled 5,32,000 flights this year, a 10 per cent hike from last year. The Chinese are getting creative with their Chunyun rush in the Year of the Pig. They have started using the ‘social credit system’: People with social and economic ‘wrongdoings’ will be restricted from travel. They have also started use of facial recognition technology and robot guides for the ease of the travellers. Two new dog breeds — Grand Basset Griffon Vendeen and the Nederlandse Kooikerhondje — will be making their debuts at the Westminster Kennel Club dog show next month, which will see more than 200 breeds and about 3,200 dogs participate in America premier canine contest, reported The Washington Post, which AP originally published. The Westminster Kennel Club, set up in 1877, is the country’s oldest organisation that indulges in the sport of purebred dogs, and has been organising this show annually at New York City’s Madison Square Garden. The show, scheduled for February, will see breeds ranging from wee Malteses to strapping mastiffs compete against each other to bag the ‘Best in Show’ trophy, for which they must go through agility and obedience competitions as well as breed judging. The winner will be named on 12 February and will be telecast live on the Fox Sports 1 channel. New dog breeds compete at the dog show after the American Kennel Club gives a nod for their recognition. It is a time-consuming process that includes setting standards. Have a look at some of the dogs that were benched at a press review of the 143rd Annual Westminster Kennel Club Dog Show in New York.